Thanks to Elizabeth, aka Pema Yangchen, who brought me some amusement the other day by sending this along. If it’s possible, I would like to purchase a copy of this print. Is there a website or perhaps an email address where I might find it for sale? Sorry for the delayed reply, but I’ve been on retreat for two weeks and I’m just starting to catch up with a backlog of emails, comments, etc. Unfortunately I don’t know where you can find a t-short or print of this quote. I took the image to a T-Shirt print shop where I live in San Diego. They had me pick out a style of T-shirt in a vast inventory they had, and the color I wanted. I presented the image to one of the graphic design artists working at the store. They were able to download it, and flawlessly print the image on the shirt using an app technology called ILLUSTRATOR. Came out great and I’m the only one who has it. 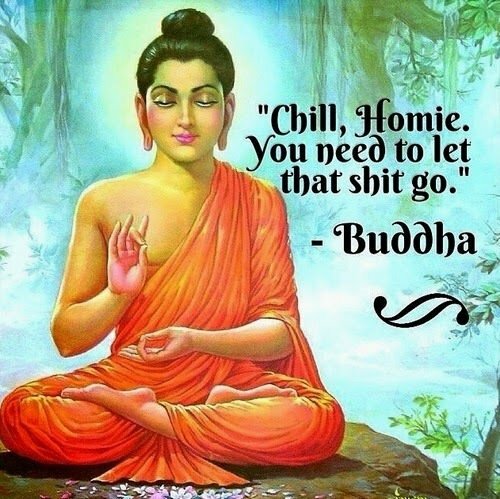 Hope that helps if you haven’t got it done already..
* to the owner of this site, if you visit the link I posted you’ll notice that I had used the hashtag #fakebuddhaquotes, as I was partially inspired by your excellent work. Thanks for this info, Harry. Thank you Harry McKenzie, for your post and for the background information on the “Chill, homey……” Poster. Brilliant work! Kudos to you for giving props to Someone Out There who obviously gets it! Perhaps, being awake & aware, they will care more that the message is received and less about material rewards. I took a photo from a coffee mug with the same quote and sent it to Vista Print to make a t-shirt for my 92 year old mother-in-law. She loved it, since she is the one who gave me the coffee mug.